The inaugural Hove Book Festival, founded and curated by bestselling author, Dorothy Koomson will run from Thursday 3rd April to Saturday 5th April 2014. Created to celebrate great storytelling for all ages, the launch line-up includes authors Lynne Truss, Alexandra Heminsley, Bethan Roberts, Araminta Hall, Simon Toyne and Eleanor Moran and a range of events including ‘Write by the Sea’; ‘The Big Book Quiz’ hosted by BBC Radio Sussex and Surrey presenter, Sarah Gorrell, appearances from ‘Stripy Horse’ and a series of ‘How to...’ writing sessions. Write By The Sea With Simon Toyne, Bethan Roberts & Dorothy Koomson Three best-selling authors talk about how they got published, how they come up with ideas for their books and what it’s like to be a writer who lives near the sea. The Big Book Quiz With Lynn Truss, Tom Bale, Joanna Rees, Mark Barrowcliffe and Alexandra Heminsley 5 well-known, local authors will head up 5 teams to find out who knows the most about books. BBC Sussex & Surrey radio host Sarah Gorrell will be asking the questions and interviewing the authors. How To Write A Bestselling Fiction Series With Elly Griffiths 1pm Elly Griffiths, the bestselling author of a series of crime books currently in development with the BBC, shares her secrets on how she puts together her complex, linked series of stories. How To Write For TV With Eleanor Moran 5:30pm Not only is Eleanor Moran a bestselling author, she’s also a TV drama producer who’ll be revealing how you can put together a story for the small screen. NOTES TO EDITORS: Dorothy Koomson is the international bestselling author of 9 novels and her sales exceed 1.5 million copies in the UK. Translated into 30 languages, Dorothy’s books are powerful, thought-provoking and compelling ‘emotional thrillers’ where moral dilemmas are central and where the complex emotions of family and friendships are intertwined. The Rose Petal Beach, Dorothy’s 8th novel, was shortlisted for a Specsavers National Book Award in 2012. Dorothy’s 9th novel, The Flavours of Love is published in paperback on the 10th April 2014. 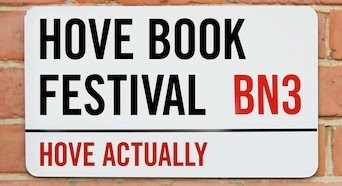 The Hove Book Festival runs from 3rd – 5th April in Hove Library and The Hove Centre, Hove Town Hall. Great post. Thanks for sharing your thoughts with us!